Glycol Chillers – TEMPEST, Inc.
Glycol chillers are commonly used for cooling fermentation tanks, brite tanks, and wort coolers in the brewing industry. Glycol chillers are used to provide reliable temperature control for fermentation and storage temperatures. 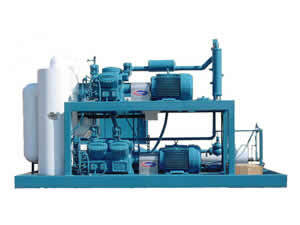 Glycol chillers come as high, medium, or low temperature chillers. 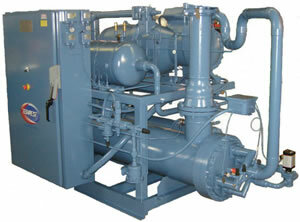 Most glycol chillers use one of two components to carry out their cooling effects. The first is ethylene glycol which is a colorless, odorless, low volatility liquid that does not contain any additives. EG is perfect for recirculating chillers and has good rust inhibitors. Ethylene glycol can be used safely in industrial settings due to its relatively high flashpoint at 240°F. The second is propylene glycol which is a very good antifreeze and fluid transfer medium. PG is a good option for use in food and beverage applications because it has low toxicity and does not linger in the environment as it is biodegradable. Glycol is used for certain chillers over water because glycol is an antifreeze and so, can be cooled below freezing temperatures without freezing, this in turn makes the cooling more effective. Another reason is that glycol acts as a lubricant for the chiller pump and holds temperature better than water in longer tubing runs. Some glycol chillers might also have a heater introduced into the glycol systems to heat the glycol instead of cooling it. This can be very helpful in cold weather when you want the fermentation process to complete quickly. Finally, it is important to make sure that the correct mix of antifreeze fluid protection is put in the chiller for effective performance. Glycol Chillers Glycol chillers are refrigeration systems which circulate an anti-freeze and water solution to help cool a variety of equipment and processes. These chillers use an anti-freeze called glycol from which they receive their name. Since glycol is a food grade anti-freeze, these types of chillers are most frequently used in the food and beverage industry.